I havent watched many films with my father. Although he is an ardent consumer of all art forms, he rarely had the time to take us to the cinema, the theatre or for musical recitals. And yet, I distinctly remember how he made it a point to take us to see Sinhabahu and Maname, patiently guiding us along the story during the interval. I would have been around 10 years old at that time. I also remember how he took the family to see the films Rekava and Sandesaya. He was quite excited and as is his usual practice, gave us an introduction of sorts to the films, the kind of preamble that ambles along until it becomes virtually a history of Sinhala film. That was the first time I heard of Lester James Peries. It took me at least a couple of decades more to understand more fully the worth of the man and I am still not sure if I really appreciate his contribution to our society as a writer, film-maker and a human being. "I believe that the history of any national cinema is the history of the growth and development of its film makers  one is indistinguishable from the other". That observation was made long ago by Lester James Peries, writing about the American contribution to International Cinema. If that be the case, any historical account of Sinhala cinema would necessarily include several chapters on Lester himself, for today, given almost half a century of excellence in the field, Lester is probably one of the few people who cannot be written out of that script. 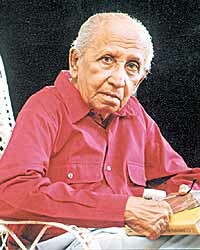 Lester was born on April 5th, 1919 in Dehiwala. "My mother frequently told me that I was actually born on the first, whenever I did something silly," said Lester, immediately demonstrating that he could laugh at himself, that rare quality which signifies the amount of territory won back from the enemy called arrogance. He had an older sister and two younger brothers, Ivan (an outstanding painter) and Noel (who became the Chief Engineer of Air Ceylon). Their father, Doctor James Peries, had been mad on cricket and in fact had even played county cricket for Scotland. He was so hooked on the game that he had laid out a matting wicket in their garden. The children had therefore grown up in a strong cricketing culture to which Lester attributes his inability to "get out of the TV" when there is a cricket match being telecast. Their mother, Winifred Grace Jayasuriya, had been quite dominating, and was the total opposite of her husband in terms of temperament. "She ran the house and she ran us, and thank God she did it!" His father had been an Old Royalist, but his mother had insisted that they couldnt afford to send their children to Royal and young Lester had ended up at St. Peters College, where he had come under the influence of Fr. Peter Pillai. Fr. Pillai had wanted Lester to become a priest. Lester had other ideas and had argued "Father, you need a vocation to become a priest". Fr. Pillai had retorted, "Nonsense! You decide to become a priest, much like you decide to become a doctor or an engineer. There is no heavenly character telling you what you should become!" Having won all the prizes for writing at St. Peters, Lester was bent on becoming a writer. Just before sitting for his Matriculation exam, Lester had come under the influence of Lionel Wendt, who knew his brother Ivan, having bought one of his paintings. Lionel Wendt was putting out a fortnightly paper at that time called "Kesari". "Lionel encouraged me to write for the Kesari. The paper carried good arts pages. Len Van Geyzel was the literary editor. He was a superb judge of writing. Wallace Stevens, the great American poet never published a poem without first showing it to Len. His standards were so high that they inhibited Len from writing. "I was determined to become a writer, so I left college and refused to pursue my studies. For three years all I did was lock myself in my room and read, thinking I was teaching myself to write. I wrote for the Kesari and occasionally for the Times of Ceylon. I wrote the inevitable book of poems, "The Cathedral". I was greatly influenced by Dylan Thomas at that time. Lyn Ludowyk told me You will improve with experience and when I asked him In what way? he said By living. That book didnt come out of genuine experience. "My decision to become a writer came as a shock to my parents and they got Fr. Pillai to talk to me. He wanted to knock me out psychologically, obviously, for he asked What makes you think you can write in English? He said, eventually you will have to be a journalist. You will have to steal government documents. You are too timid to do that." Around that time Lester had got to do some freelance work for Radio Ceylon. He reviewed books for a programme called "Radio Bookshelf". "The first book I reviewed was The Curtain of Green by Eudora Welty, which I had also reviewed for the Kesari. Then the war came and an English army man took charge of Radio Ceylon. He wanted to do radio plays and wanted me to write scripts." Radio work had led Lester to form a theatre circle with Sali Parakrama, Sita Jayawardena, Vernon Abeysekera, Lorraine Forbes , Osmund Jayaratne, and Anandatissa de Alwis. We did several radio plays. I wrote a play called A school for wives which was a flop. Most of the others went on to form The Drama Circle and took to the stage. I cant remember if I was paid. Money was the last thing anyway. We did it out of love." His brother Ivan had got a scholarship to study painting in London. His mother suggested that Lester go to London to see him. She had promised to give him an allowance for six months. He ended staying there for almost seven years. "Looking back, I can say that those were the best years of my life. I was already writing on music, films and plays for the Times. The editor, Frank Moraes, asked me to contribute a piece once a week on the performing arts plus anything interesting in London. The Times had an office in Fleet Street. They had a staff of 18 people but only two in the editorial. John Hockin, who was at Lake House for a long time, had just been crimped by Times. Frank gave me a letter of introduction for I was asked to route the copy through the London office. Hockin would have read my copy, and he eventually hired me." The career defining moment in Lesters life had come when Hockin had asked him to interview Ralph Keene, a documentary film maker who was going to Ceylon to take charge of the Government Film Unit, as its Chief Producer. This was in 1952. "At that time I had already made three amateur films with Hereward Jansz, a Sri Lankan born still photographer. We produced these experimental films with a 16mm movie camera which was purchased after trading in Herewards Speed Graphic camera. The first was called Soliloquy, which was about a painter. It won the Roger Manivell Award for best technical expertise at the Amateur Cine World Competition. This was followed by Farewell to Childhood acclaimed as one of the 10 best films of the year." At the end of the interview, Keene had asked Lester arent you also making films? Apparently he had been one of the judges that had selected his film for the best technical expertise award. "He asked me what the hell I was doing in London when Ceylon is made for cinema! I told him that I didnt want to join a government department. He said he had a free hand and promised that in a couple of years I would be doing my own documentaries." "I couldnt make up my mind to return. I was also married to an English girl at that time. My wife, Margaret, was the daughter of the owner of Sir Richard Steele, a pub near where we lived. My parents didnt even know that I was married. Keene wrote to me every week, urging me to join him. He even promised me a salary at the highest point in the scale. All the money I earned from the paper went to make films. It was my wife who convinced me that it would be better to go back where I wouldnt have to bear the cost of producing films, which is what I enjoyed doing anyway." Coming back changed Lesters life. "I would have been lost in London. Had I stayed back, I would have been running a tobacconists shop. I told my parents about Margaret. They were naturally shocked. She joined me after two months and although my family welcomed her warmly, it was not easy for her to adjust to life in this country. She went back after two years on the understanding that I would return to England in a couple of years. But I knew I had already come home and also around that time there were the first hints of a feature film". The third "figure of destiny", as Lester likes to call the characters who influenced his life, following Wendt and Keene, was his cousin Christopher Peries. "Christopher wanted to create a company to make feature films. He said he had already spoken to people who would put in the money and promised to give me a free hand. I said I have to think about it, and he said he would give me a week to make up my mind." "My colleagues, Willie Blake, who was an assistant cameraman and Titus Totawatte, who was an apprentice, encouraged me to take up the offer, saying they would leave with me. My boss at that time, P. Nadesan didnt want me to leave. My parents were horrified because a government job was the pinnacle, and they couldnt understand why I wanted to quit, especially since I was doing what I liked." Just as he believes there are figures of destiny, Lester also believes that destiny does not have an agenda. Like most creative artists, perhaps he was driven by a certain spontaneity and had the instinct to seek spaces conducive to the full flowering of the creative urge. "My feel was more for fiction, people, characters, human beings. So I jumped. The registered offices of Chitra Lanka Ltd., was 223 Bloemendhal Road, i.e. where the Island is now located. This is where I wrote the script for Rekava and interviewed and cast the characters. The Chairman was Chandra (Sarath) Wijesinghe, Upali Wijewardenas uncle. George Chitty, QC, and H. W. Jayewardene, QC, were the other directors. Aubrey Collette was the artistic advisor. "We never realised what we were going to be in for. I wrote the mothers role for Iranganie Serasinghe. The little boy had never seen a camera before. We got some Tower Hall people involved. All we wanted was to make a good film for the local market. We were not thinking of Cannes, Berlin or even the Maldives! It took us a year to make the film. Sound was a nightmare. We lit Rs. 6000 worth of crackers to chase away the crows. There were marvellous reviews, but the film failed financially. The audience just couldnt understand. I even included six songs of Sunil Shantha." However, something happened which in a way salvaged the film. Maria Schell, the famous German actress, happened to be holidaying in Ceylon and she had wanted to see a local film. She had been taken to the Roxy, where Rekava was being screened. "She was due to leave in two days. The very next day she gave an interview to the Observer and said that the film has to be sent to Cannes. The Directors of the company agreed to take it to Cannes. There we got good reviews and 4 sales, the French, the Germans, British and Russian buying it. Sarath, who was a staunch supporter of SWRD, left and became President of the Senate. The others were lawyers, the film had failed, so they decided to close down. This was a big mistake. My next film, Sandesaya, was made for the 10th anniversary of Cinemas. Gunaratnam wanted a prestige film, he said Lester, I dont mind losing money on it. Sandesaya ended up minting money! The royalties for the song Purothugeesi Karaya would have earned him more than one lakh. One hundred and thirty two copies were made. In fact copies were made until the original negative went to pieces!" It was during the time of that first submission to the Cannes Festival that Lester met Sumithra, that other figure of destiny in his life. Sumithra had been staying with Dr. Vernon Mendis, who was the Charge- dAffaires in France. "Titus and I were staying in the hotel opposite his house and he invited us to stay with him. Rekava was the first Sinhala film that Sumithra had seen. I already knew her brother and he had wanted me to advise her about her studies. She wanted to study cinema and I recommended that she go to London. We did Gamperaliya in 1963 and married in 1964." Including Rekava, Lester has made twenty feature films. Twenty films over forty five years meant that Lester would have been out of work for long periods of time. Most of the property he inherited was used to make films. I asked him what he considers to be his best film. "I am inclined to say, my next film" he quipped. "Rekava is special. It is like the first love. Gamperaliya changed our lives. People say that my next film, Wekande Walawwa, is the best. I cant really judge my films, because I am too close to them." Lester has been honoured with the title Kalasuri in the first round of such awards in the early eighties. He was won countless awards locally and internationally for his films. The one he cherishes most is the "Legion of Honour" conferred by the French Government, "for the enrichment of film-making". He was honoured in the highest category of "Commander". In the year 2000, the Indian Government honoured him with an award for lifetime achievement in film-making. The first such award for foreign film-makers had been given to Bertolucci the previous year. The award for 2001 was to be given to Bergman. Excellent company to be in, certainly. And yet this man, who perhaps deserves the "needs no introduction" qualifier prior to biographical sketch than anyone else, insists that his contribution to cinema pales in comparison to what cinema did to him. "I didnt come into this to get awards. Cinema salvaged me. It brought me to my roots. I had a western education. I was born into a staunch Roman Catholic family. This was two removes from the heartbeat of my people. It was cinema that allowed me to get this close to my country and my people." He refused to take credit for what most people consider to be the excellence he personifies in the industry. "Film-making is a complicated, co-ordinated effort. The analogy that comes to mind is an orchestra. The film director is like a conductor. He has to interpret a script with a whole group of people." His humility is probably his most endearing quality. Like all great personalities, he obviously considers himself a student. For Lester, books are like an extension of his body. "I lost the sight of one of my eyes. I dread losing my other eye too, not because I would not be able to see films anymore, but because I would never be able to read again". According to Lester, theres a lot more to know about films. He was not talking about just the technological aspects. "Take the Blair Witch Project which was made using the most primitive technology, considering we are in the digital age. Clearly there are many secrets in the media. Cinema is still only 100 years old. We are still in the initial stages." What makes a master in any field a giant, I believe, is his commitment to learning and even more important, his commitment to teaching. Lester has over the years nurtured many a young film maker. I asked him about the future and who among the new directors held the most promise. "When people ask me that question, I tell them that the future of Sinhala film is Prasanna Vithanage. He is disciplined, gifted and a precision worker. Asoka Handagama represents another stream. He is exploring along new avenues and is also doing very important work, this is why I worked hard to promote his last film." Writing about the pioneering American film maker, David Wark Griffith, Lester made the following observation: "If every medical blotter, every poster on the wall bears the imprint of Picassos great inventive genius in design and colour, and every music score in the cheapest B grade movie echoes the rhythms of Stravinsky, then each time we pick up a camera and make a film, wherever we are, we are paying our own tribute to a great master". Not everyone rises to be worthy of such homage. Lester James Peries, if anyone, deserves such tribute. Growing up, we inevitably encounter Martin Wickramasinghe a personality who according to Lester, was on the same wave length, "although I have less of the political edge". At some point, Sarachchandra and Amaradeva arrive. Perhaps Chitrasena too, although his art is less preservable that the others I have mentioned. Then there is Lester James Peries, whose treatment of the human subject opens a kaleidoscope of windows through which, if we are patient and humble, we can discover those things which help make us more sensitive human beings.